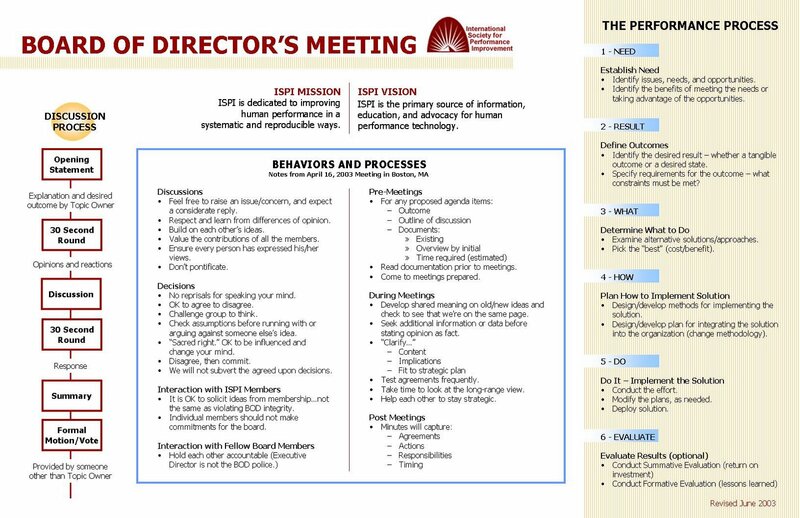 A former client and a co-board member of ISPI (back when he was President-Elect and then President) – John Swinney emailed me yesterday asking if I had a copy of the materials I had described to him back in 2003 about the “dialogue process” I had wished to impose into how Board Meeting were run when I became President of ISPI in April of 2003. 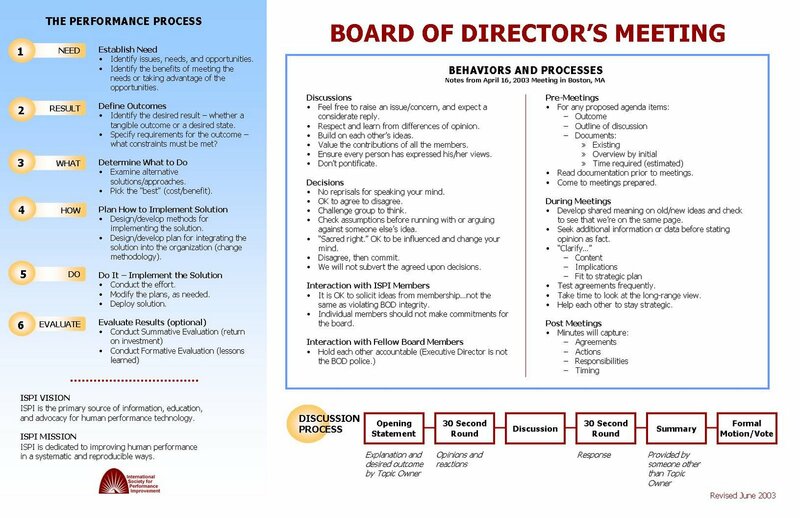 I had created an 11×17 laminated “placemat” for each Board Director. To guide me and them with a little “declared structure” for our deliberations. I believe that it’s best for everyone to declare one’s intentions/thoughts/questions/comments/concerns for clarification purposes early, at the start of the dialogue, and then go from there. The original 1-sided laminated placemat evolved to 2 sides – I have found 4 iterations for the 6 meetings that I ran during my term in my search for John’s request. Most updates were from suggestions of my fellow board directors that term…Don Tosti, Clare Carey, Jeanne Farrington, Barbara Gough and Jim Pershing. Most important for me was the dialogue process I wished us to use, and as it was my turn to run the meetings, having seen 3 others run theirs for their 6 meetings per year during their 3 terms. I had watched Dale Brethower, John Swinney and Jim Hill run their meetings and I tried to take the best from each of them and add a little bit of “declared structure” to address an annoyance. John wanted this set of materials for a friend who was taking on a similar role with another group and had found the first meeting to be chaotic. No one likes that, even the people who cause the chaos. I had felt rushed in almost all of the Board meetings I had participated in…rushed to state my view…rushed to a decisions without hearing from everyone and any real dialogue. We were almost always too rushed to tell everyone what we were each thinking so that everyone could address each others’ thoughts directly AND share with all of us their thoughts – so that everyone could “talk through” something. What usually happened is that some Directors “held back” politely waiting to hear from others – who sometimes dominated the topic due only to their passion and not because they didn’t want to hear from others. Invariably the clock would almost always seem to “run out” on the agenda item and the President would need to balance “more discussion” with “managing the total agenda” so that we wouldn’t “not get to something” because the agenda items were negotiated and not getting to some one board member’s item on the agenda might cause an issue. Everyone is entitled to get a little unhappy that THEIR ITEM didn’t get addressed because of poor meeting management skills. So I wanted to avoid that too – but ensure that everyone got heard. And more than once. Formally. So the “declared structure” I verbally explained and graphically presented – via the first iteration of the placemat – to “my” Board contained 2 places where I wanted to give everyone “30 Seconds – no more – but less was cool too” to state their views both BEFORE and AFTER a more free-for-all (but not quite) DISCUSSION period where I would manage the item and the clock as the meeting agenda dictated. 1- Opening Statement – by the Item Owner ensuring that if this was their baby that they got to “position” this any way they wished and the words didn’t have to come from me and therefore too-often be “not quite right.” Causing “rework” and “double time” being subtracted from the allotted time on the carefully negotiated and planned agenda. 2- 30 Second Round – of initial questions/comments/concerns from everyone, where we could hopefully see more quickly that we were all in agreement and avoid a round of heated agreements caused by semantics. It’s not just semantics – it’s always semantics! – author unknown. If it was a hot or complex item these would be “boarded” to keep them visible. I tried to use this sparingly as this too came down to the semantics of the words chosen by the scribe…all too often just not right enough to convey…. Or we would see what really needed to be addressed in the next step in terms of initial disagreements or potential disagreements, and therefore we would likely be more successful and efficient there in what topics we really talked through and addressed to adequately cover all of those questions/comments /concerns. 3- Discussion – for the allotted time or as adjusted due to group consensus about halfway through the allotted time. Again – focused squarely on those initial questions/comments /concerns and any others that came up via this segment of the process. 4- 30 Second Round – so that everyone can state where they “ended up” with their thoughts and/or their initial questions/comments /concerns – before “the vote” or “Motion” of “action/inaction decision” that is to be achieved two steps away. After a summary of what’s been expressed. 5- Summary – of the discussion – by someone other than the Item Owner ensuring that if this was their baby that they didn’t get to “position” this any way they wished and the words (still) didn’t have to come from me and therefore too-often be “not quite right.” Causing “rework” and “double time” being subtracted from the allotted time on the carefully negotiated and planned agenda. 6- Formal Motion/Vote -someone would then Motion for a vote, an action, or whatever…. Is this structure “overkill” for your needs? Adapt it! You might be following Robert’s Rules of Order formally or you may be doing this quite loosely based on the Rules. Or just “way too” loosely. In any event I offer you this example of a “micro-structural guide” for agenda item deliberations – so that you might adopt and/or adapt them to meet your situational requirements.